Business Jet Traveler recently weighed in on the year that was 2010 in the realm of used business aircraft sales. It still is somewhat obvious to most in business, whether aviation related or not, that markets remain timid. However, some segments of the private jet market have fared better than others. Furthering a trend seen in new models presented at the NBAA Annual Meeting & Convention in Atlanta this October, large-cabin long-range jets continue to move. 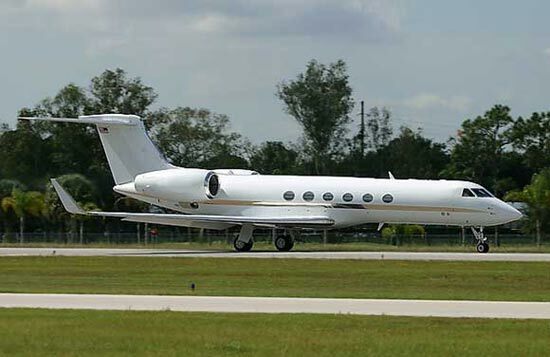 The BJT article notes that buyers went after these aircraft, such as the Gulfstream V at prices below $20 million and the Gulfstream IV/SP under $12 million, and Gulfstream IV under $10 million. The article notes that these prices hover around half the value for these aircraft three years ago, when the industry saw its pre-recession peak. Many of the used business jets advertisements placed at GlobalAir.com seemed to reflect that trend, although this is unscientific and based only on memory. Marketing among larger Hawker and Falcon Jet models for instance, in addition to the above-mentioned Gulfstream aircraft, appeared more agressive than with some other models. The BJT article says other business jets, such as the Learjet 60XR, saw a tougher time in a sometimes-stagnant used-aircraft sales market.